If you are like me you love the garlic dipping sauce from Papa John’s. I love this buttery garlic sauce; it is the perfect dipping sauce for pizza. Delicious yes, healthy well, chances are you aren’t eating pizza to start with. You might wonder how you can make your garlic dipping sauce for pizza that is similar to Papa John’s. I have a recipe for you. Papa John’s garlic dipping sauce is a creamy garlic sauce that is perfect to dip those pizza crusts into. When you make it from scratch, you can use it for so many more things. You can spread it on bread for a simple garlic toast, or even spread some on a steak just before serving. Now, let me first say, their dipping sauce is vegan, so if you want to duplicate what they do truly, I suggest you use a brand of buttery like sauce like Smart Balance which is vegan. It has good flavor and will make an excellent sauce. I know a lot of recipes online suggest that you use margarine. I personally dislike margarine. I tend to feel that if you are going to enjoy a buttery sauce, why not use butter. What’s the problem? Butter separates and gets weird. I have a suggestion for you though. We are going to make our sauce with clarified butter. By taking this extra step, you will end up with a creamy, buttery sauce that you can use to dip pizza into or even spread on some bread or a piece of steak. When you clarify butter, you will separate out the milk solids so what you are left with is butter with only that is entirely clear, and it won’t separate. When you make clarified butter, you will lose some of the butter in the process. So you will end up with about 25% less. You will end up with a rich, intense butter flavor that will be amazing, and you will be certain to love dipping your pizza slices into this sauce. 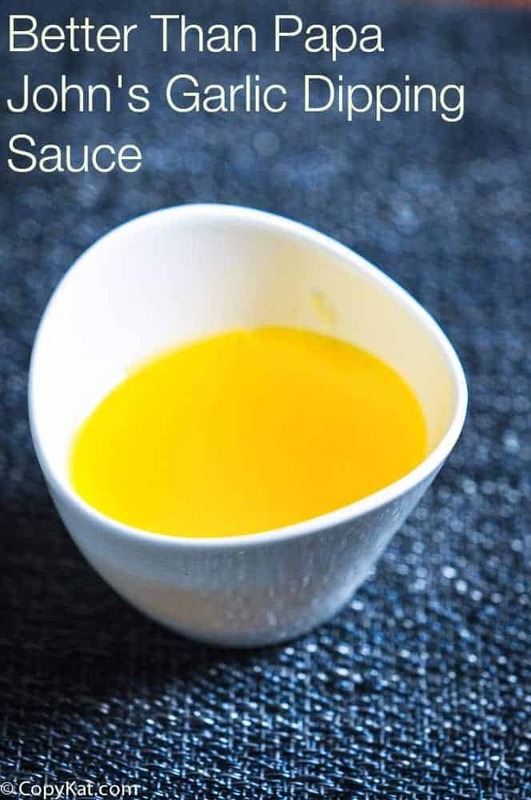 Make this amazing garlic butter dipping sauce at home. Place butter into a small sauce pan over low heat. Allow the butter to gently melt. Do not stir the butter while it is melting. The butter will separate into three different layers. The butter will become foamy on top. There will be clear layer in the middle. Towards the bottom of the pan will be a layer of the milk solids.When the foamy layer forms. Spoon off the foamy layer and discard. Gently decant the middle layer of the butter into a small dish. You should end up with about a tablespoon of milk solids in the bottom of the pan. Discard the milk solids.Stir in garlic powder and salt until dissolved. The garlic butter is now shelf stable and does not need refrigeration. Some of these comments show more peolpe need to cook IN rather than eat OUT all the time. No, garlic powder, granulated, or fresh will NOT mix with the oil from the clarified butter. However if you let it sit for a day or two, or use infused evoo, the oils will take on the garlic flavor. Then you have to strain it to remove the garlic. Now you have something more like PJ’s dip. Now no one has to fight over the garlic butter. Yes! I would like to mention that Papa John’s sauce is not vegan. Lactic acid comes from milk. Very misleading. Industry lactic acid does not come from milk, bacteria produce it. Many vegan products contain it. I found that the most effective way to recreate the sauce is to not entirely melt the butter, so it remains partially a solid. This way, when you mid your Salt and garlic powder in, nothing falls to the bottom. The soft, sticky butter hold all the seasonings the same. Some of the confusion in the comments in regards to the garlic not mixing in a probably due to semantics. Many people call granualized garlic, garlic powder when they are 2 very different things. I would not expect granualized garlic to mix very well, where as garlic power would. You have a typo… you put you instead of your. The picture can’t be correct. The garlic powder doesn’t dissolve and just sits as a brown powder below the clarified butter. This was a waste of butter. Try a different form of garlic instead of the garlic powder. I used a garlic paste out of a tube since I didn’t have any powder on hand, and it worked fine. Also, if using salted butter, it doesn’t really need any more salt. I have also created it just using Smart Balance in a microwave, and that was much less of a hassle, too. You should try a different brand then!